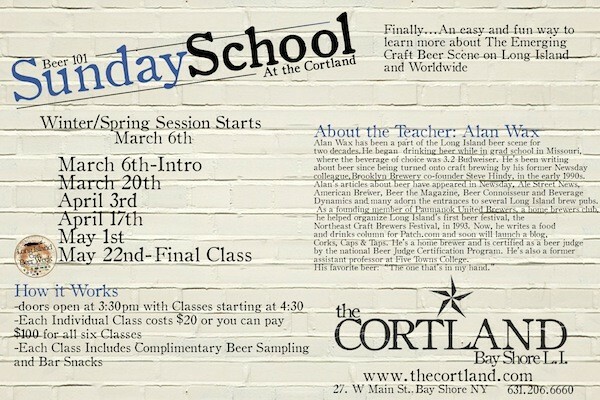 Between tonight’s “First Firkin Friday” with Long Ireland Beer Company Breakfast Stout, Saturday’s “Brew & Chew” with Great South Bay (two hour open bar paired with appetizers from The Eatery at Tullulah’s; reservations at http://thecortland.com/events) and the official launch of “Sunday School,” a series of six educational beer courses with certified Beer Judge Alan J. Wax, on Sunday, Super Neat proposes a “Cortland Slumber Party” for the weekend, as there is no legitimate reason to depart the premises. We’ll bring the Care Bears night light. 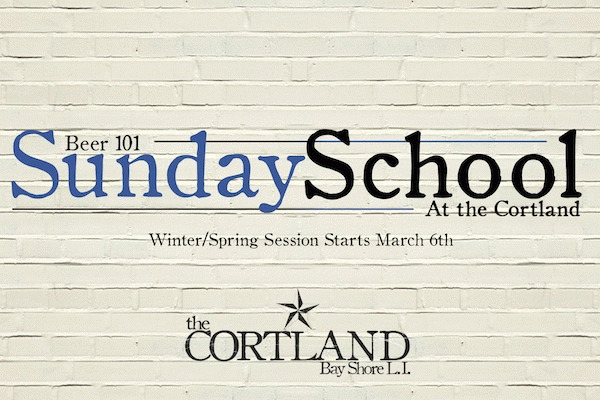 BAY SHORE, NY (Feb. 18, 2010) – The Cortland, Bay Shore’s newest craft-beer bar, will launch “Sunday School,” a six-class Beer 101 course on March 6. The course will culminate on May 22 to coincide with Long Island Craft Beer Week. To be taught by former Newsday beer writer, Alan J. Wax along with guest speakers, the class is meant to be both educational and fun. Participants will learn about the history of beer, how it is made and about different styles of beer from around the world. It is open to anyone 21 and over. The Cortland will be closed to the public during the approximate 90-minute class, which will run from 4:30 to 6 p.m. on class days, March 6, March 20, April 3, April 17, May 1, and May 22. The course fee is $100 per person for all six classes or $20 per person for individual classes and includes educational materials, samples and bar snacks. Wax, the instructor, has been a leading figure on the Long Island beer scene for nearly two decades. In addition to Newsday, his articles have appeared in Ale Street News, American Brewer, Beer the Magazine, Beer Connoisseur and Beverage Dynamics. He is a home brewer, helped organize Long Island’s first beer festival and is a certified Beer Judge by the National Beer Judge Certification program. He also was an associate professor at Five Towns College in Dix Hills. Currently, he writes a food and drink column for Patch.com. The Cortland is located at 27 W. Main St., Bay Shore, NY. (631) 206-2220. For information about the Cortland go to www.TheCortland.com.